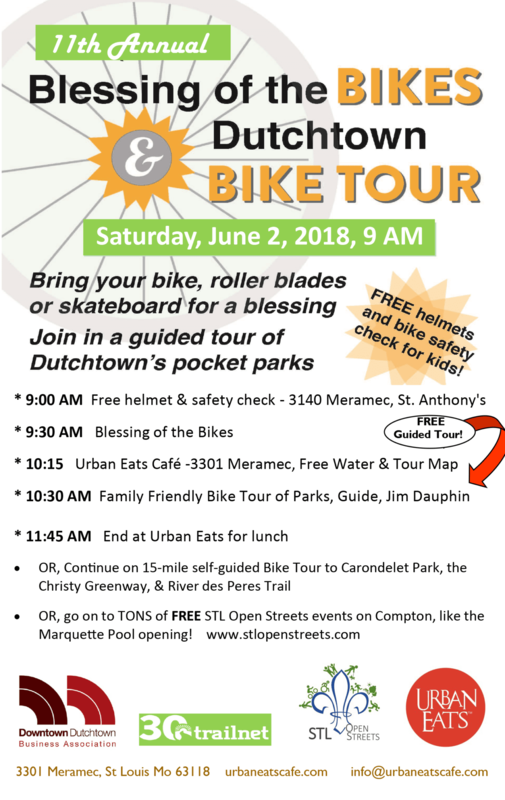 We previously wrote about the annual Dutchtown Bike Tour and St. Anthony’s Blessing of the Bikes. 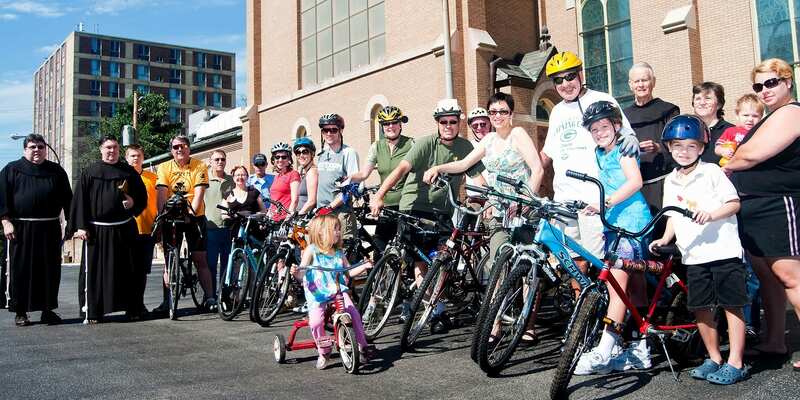 The annual Blessing of the Bikes at St. Anthony of Padua is Saturday, June 2nd at 9:30am. 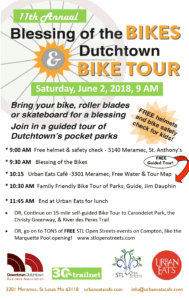 Following that, the Dutchtown Bike Tour departs from Urban Eats Cafe at 10:30am and makes its way through Dutchtown, eventually rolling through STL Open Streets before finishing up back at Urban Eats. 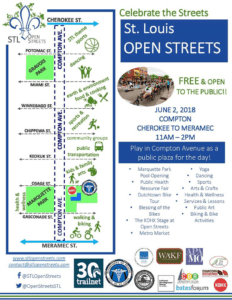 Also on Saturday, June 2nd, from 11am to 2pm, is STL Open Streets. 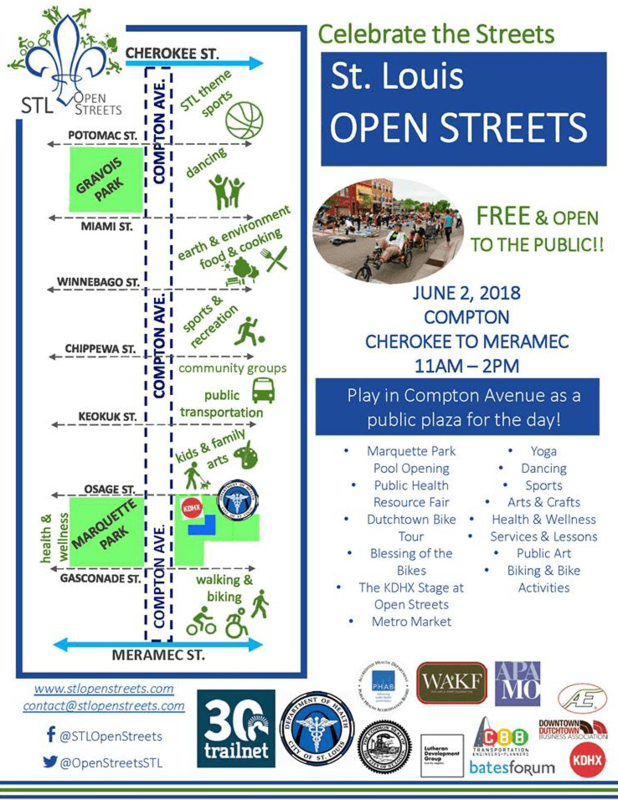 Compton Avenue will be closed to cars from Meramec to Cherokee, allowing pedestrians and cyclists to take over the street. Activities and booths will line the street, and KDHX‘s live music stage will be at Marquette Park on the corner of Compton and Osage. Additionally there will be a health and wellness fair at the park. Read our earlier post about Open Streets here. The Gravois Park Neighborhood Association holds their regular meeting on Tuesday, June 12th at 6pm at 3353 California (the old Jefferson Bank building, just north of Cherokee). Dutchtown West also meets on Tuesday, June 12th. Their meeting is at 7pm in the banquet hall at Grbic Restaurant, 4071 Keokuk at Meramec. The Cherokee Street Business Association has their monthly meeting at Nebula at 5:30pm on Thursday, June 21st. In addition to business owners, the meeting is open to residents and property owners in the Cherokee Street community and all are encouraged to attend. Marine Villa‘s regular meeting is at Sister Cities Cajun at 7pm on Monday, June 25th. The 20th and 25th Ward Democratic Club come together on Tuesday, June 5th to host a candidate forum ahead of the upcoming August primaries. The forum will be at the German Cultural Society, 3652 South Jefferson. Candidates (or their representatives) for License Collector, Recorder of Deeds, Collector of Revenue, State House District 81, and U.S. House and Senate will be on hand. Thomas Dunn Learning Center celebrates their HiSET graduates and success stories Monday, June 1st at 6pm. All are welcome to attend the diploma and certificate presentation and reception. Thomas Dunn is also hosting a number of summer camps. Registration is required for the camps listed below. The Summer Clay Play ceramics camp for kids 10 and up runs from June 18th to the 22nd. Campers will explore different methods for creating and firing ceramics. A follow-up session, where campers will glaze and then gift their creations, takes place August 6th–10th. Campers are required to attend both sessions. Coding for Kids, instructed by GlobalHack, is a code camp for kids 10 and up during the week of June 25th. You can find and register for additional free camps at Thomas Dunn and other locations throughout the City on the City’s website. DSCC‘s Landlord Series continues Wednesday, June 13th, 6pm at Thomas Dunn Learning Center. In June they’ll be discussing tenants’ rights and fair housing issues. Dutchtown South and Erase the Trace are co-hosting another So Fresh So Cleanup. This month they’ll be at Mount Pleasant Park on Sunday, June 24th from 11am to 3pm. The Community Empowerment Committee holds their monthly meeting on Wednesday, June 27th, 6pm at Thomas Dunn Learning Center. Dinner and child care are provided. The Downtown Dutchtown Marketplace continues every Saturday from 9am to 3pm in the parking lot of the Feasting Fox. Find antiques, art, collectibles, crafts, and more. For additional information or to become a vendor visit DowntownDutchtown.com. The committees and Board of Directors of the Dutchtown Community Improvement District meet throughout the month. Find a calendar of meeting times here. June 5th through the 10th is Negroni Week at the Feasting Fox. Enjoy some classic cocktails and help raise money for PAWS, the Progressive Animal Welfare Society. The South City Sipsters meet on Thursday, June 18th at the Feasting Fox to sample and learn about beers and Rosé wines. The Feasting Fox will also be hosting a five course Beer and Wine Dinner on Friday, June 29th. Join Urban Eats on Friday, June 15th, 6:30–9:30pm, for an evening of cocktails, appetizers, music and art. Featured artists are Thomas Jackson Park and Pamela Schaffner, and Catching the Westbound will provide the music. Also, on June 8th and 22nd, Urban Eats hosts the South City Board Game Meetup from 6pm to 11pm. DT2‘s monthly After Hours event is on Wednesday, June 20th at 5:30pm. Pop-Up Professionals, a pop-up event space and consulting service, will be hosting at their space at 5203 Virginia. The Cherokee Street Community Market returns to Love Bank Park on Wednesday, June 13th from 4:30pm to 8pm. Shop for local produce, enjoy prepared food from vendors, and take in some live music. This post was updated on May 31, 2018 . Read more news about 20th Ward, 25th Ward, Camps, Cherokee Street, Cleanups, DT2, Dutchtown, Dutchtown Bike Tour, Dutchtown CID, Dutchtown Events, Dutchtown South Community Corporation, Dutchtown West, Festivals, Gravois Park, Marine Villa, Marquette Park, Meetings, Open Streets, So Fresh So Clean So Creative, and Thomas Dunn Learning Center.